A whack job preacher from Florida is getting a lot of ink about planning to burn Korans. I’ve been reading the popular press about it and there is a group which is giving away Korans. But what is not happening is that no one has been proposing that we start actually reading the Koran. We have lots of people talking about intolerance, but we dont have anyone talking about increasing understanding. I was chatting with my jewish friend Mordecia about starting study groups, where Iman’s and other Muslim leaders help direct christians and jews to find the most revealing portion of this holy book. 9/11 was not committed by Muslims, it was committed by political radicals. A strong case can be made that America had created the climate with which these people commit this act. But if we are serious about moving past 9/11, then we need to actually understand what people from other belief system see. I agree. It took a group of Iraqi students, most of whom are Muslim, spending a month at the university where I work to begin to get me educated about their faith. I’m just beginning to learn, but last year I wouldn’t have known that today is Eid, or what that meant. Friendship. We need more of that, too. I am in the states from a recent move to Ireland, and having stepped away from the US for a bit, am mystified at the mountains of hype with absolutely no substance or understanding. I am appalled by the interviews that I am seeing, and the passionate statements that include either no facts at all, or pure fabrications. 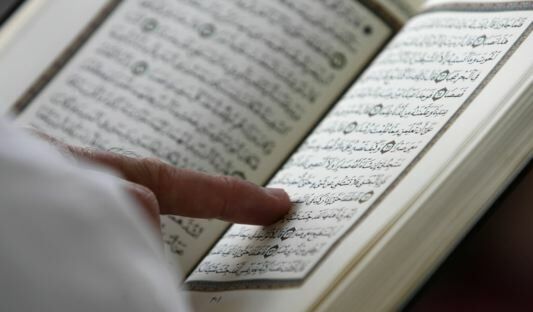 The Koran is, if you read it, simply described – The Bible – the Sequel. The continuing saga of the Judeochristian cosmology and way of describing this mystery called life on Earth. It describes the familiar Bible stories, and the story of Jesus – the revered teacher and prophet in Islam – and mostly is a tome of worship of the deity that most call God. The political radicals are not limited to the Islamic world, and in the US they come in many flavors. All of them are trying to gain control of power in some way, whether they be in search of political office, money, publicity, or religious celebrity. The rest of us would do well to come together and truly see and hear each other – and find out about the ways that each community orders their lives and describes the world. In this way we might just hold each other from being blown away by the rising winds of power struggle. Remember – power struggles through hype can never gain speed in the face of understanding and honest communication. I don’t need to read the Koran to restrain myself from killing muslims. I am not going to read the bible either, but that doesn’t mean that I have any desire to beat their heads in. People should just be nicer to each other.